2013 is flying by as expected, not by any means in a negative way. Creativity is flowing, projects are flowing, teaching is flowing, shows and opportunities are continuing energetically. It has been a while since I gave a NEWYAWK brand update. I want to share some of the exciting things that are happening as the brand continues to evolve and develop. If you are a “first timer” learning about the NEWAWK brand, you can read the bio and short start up story here. If you are familiar, and perhaps even the owner of a t-shirt, painting, or print welcome back. The month of June has been elevated with a high volume of new works produced both in and out of the studio, on the web, and in public space. The synthesis of my personal work as an artist and the brand related art continues to capture my interest. 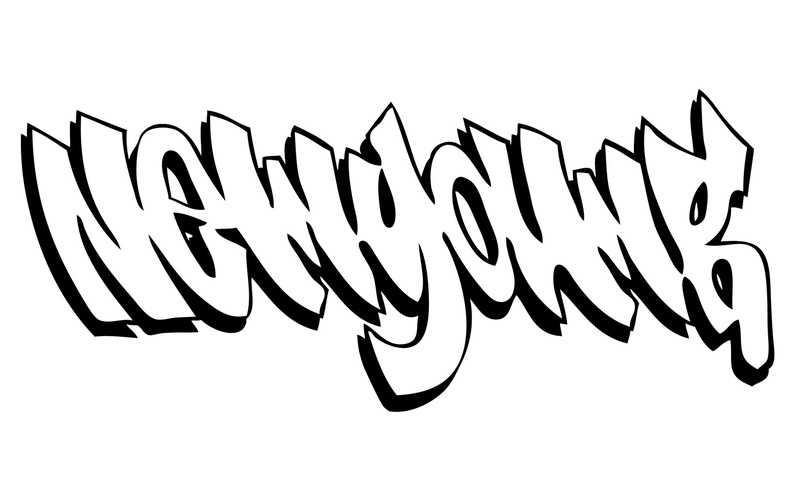 If you would have asked me 15-20 years ago, “is NEWYAWK a brand?” I would have most likely shrugged and not known what you meant even though the art was there and the tag was being written. It is indeed a brand, but it is not yet fully definable as Im co-creating it all while in process. This is purely fun, and in the long run may simply define the brand. 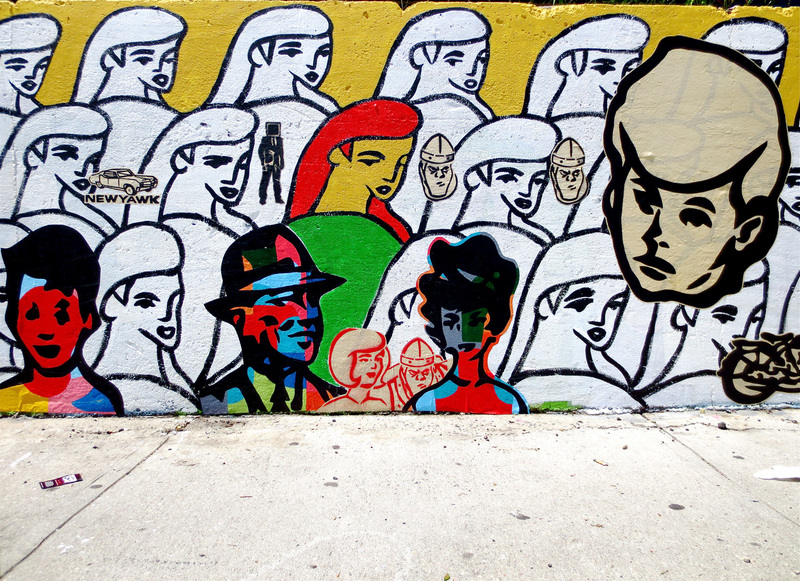 NEWYAWK made an appearance at the Ad Hoc Art Welling Court Mural project in Astoria, NY. You can read more about it from these great sources as they have written extensively about it, check out and follow @adhocart @vandalog & @bkstreetart on twitter. 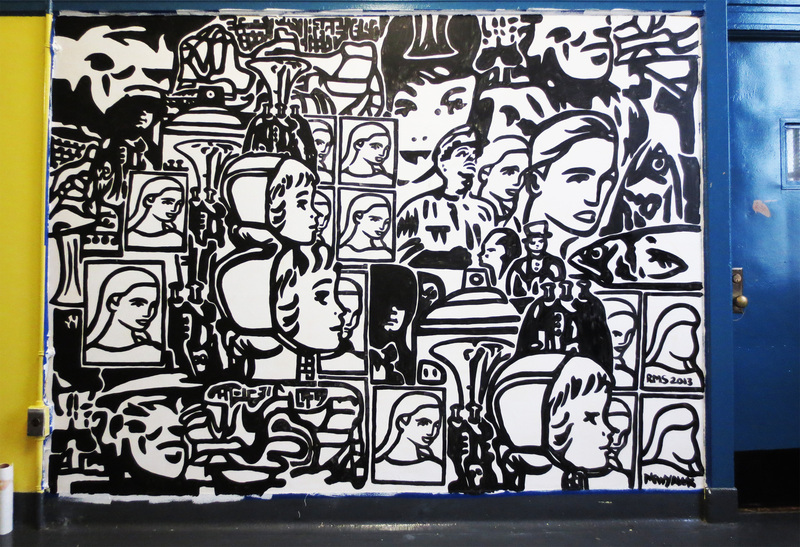 NEWYAWK also was signed to complete this new Mural at HALA, in Jamaica High School, Jamaica NY. June 2013. Aside from the fun projects above I am happy to announce the development of a new NEWYAWK series. 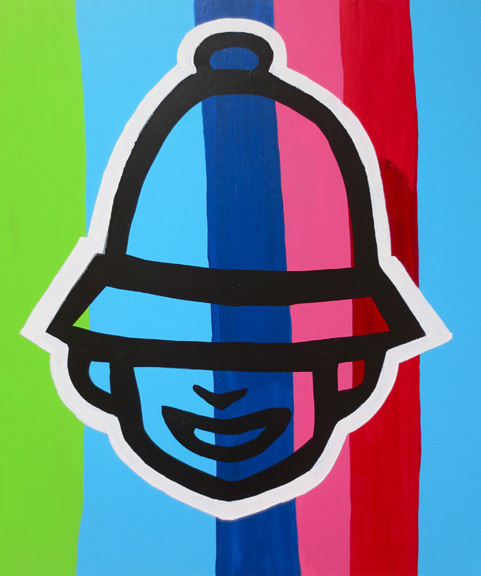 The series gives birth to a new character, a screen print series in a limited edition, t-shirts and paintings. 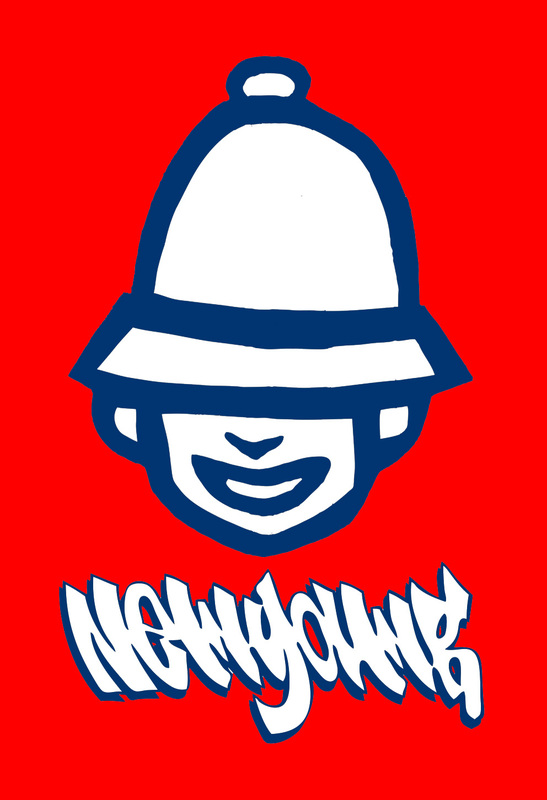 The character represents the B-Boy, both old and new school. 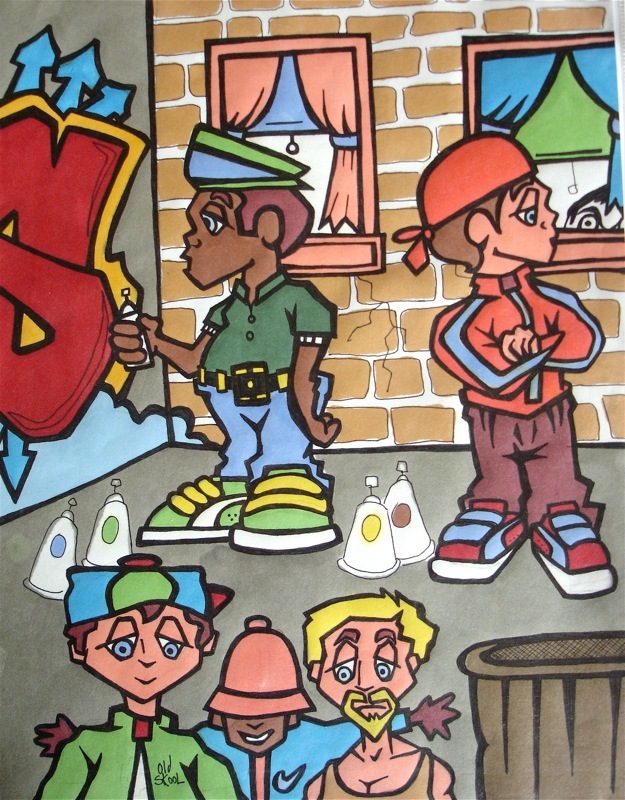 The image was pulled out of an old black book graffiti piece that I did in 1990. (This validates, once again the importance of archiving your work, and reflecting upon it from time to time.) I have always followed and had an interest in B-BOY culture, its connection to hip hop, breakdancing and graffiti. I love how this energy has spread and transcended over time and across the world. It continues to inspire my work. I re-drew the character above and generated a vector image in adobe illustrator while also re-rendering this hand style painting below. I like the tension the graphic creates between what is digitally generated, and what is manually generated, it helps give the impression that the image has existed and been updated over time, which it has as NEWYAWK has been around for quite a while. The context has changed, and that seems to be the nice part of aging as an artist. Sometimes concepts regenerate themselves because time has passed, retained experiences can dictate exactly what to do next, and how, but we have to be open to that, and we also need a developed eye to know when to identify a move that we should make. I’m doing this here, and seem to be very aware of that, hence why I feel compelled to share my journey while Im in it. “B-Boyed” Acrylic on Foam Core, 19″X19″ June 2013. I’m not 100% sure if this piece is complete yet, but it is finished enough for me to observe and think about it more. The whole painting session was started and completed in about 2.5 hours. Its all about immediacy for me. The same energy I felt when I began writing graffiti at 12 years of age. That immediate energy and feeling never left. A rubber stamp was then cut out after the painting session. 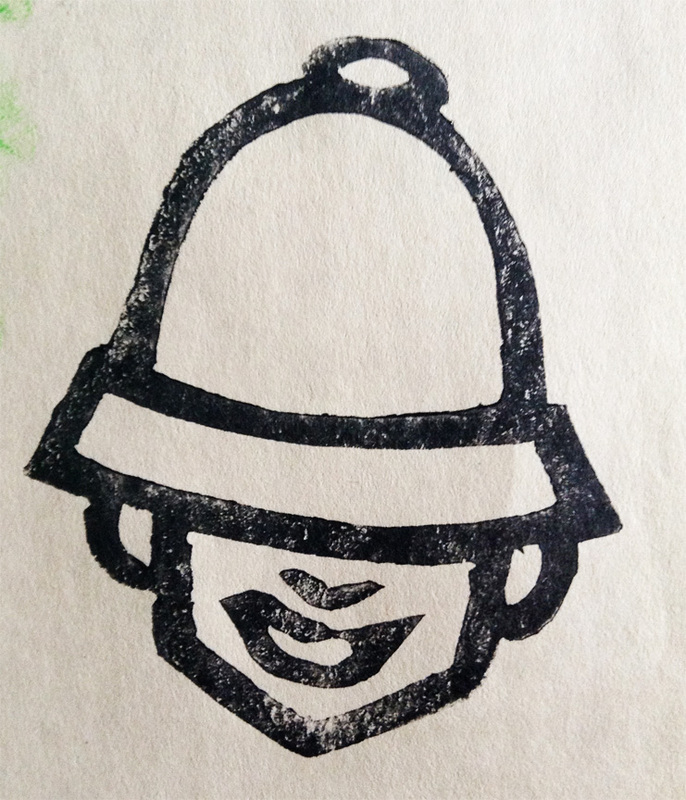 I love working with rubber stamps for line related graphics and shadow forms. The print quality can be controlled as flat and opaque or degenerated and aged. Rubber stamps can be printed onto anything. 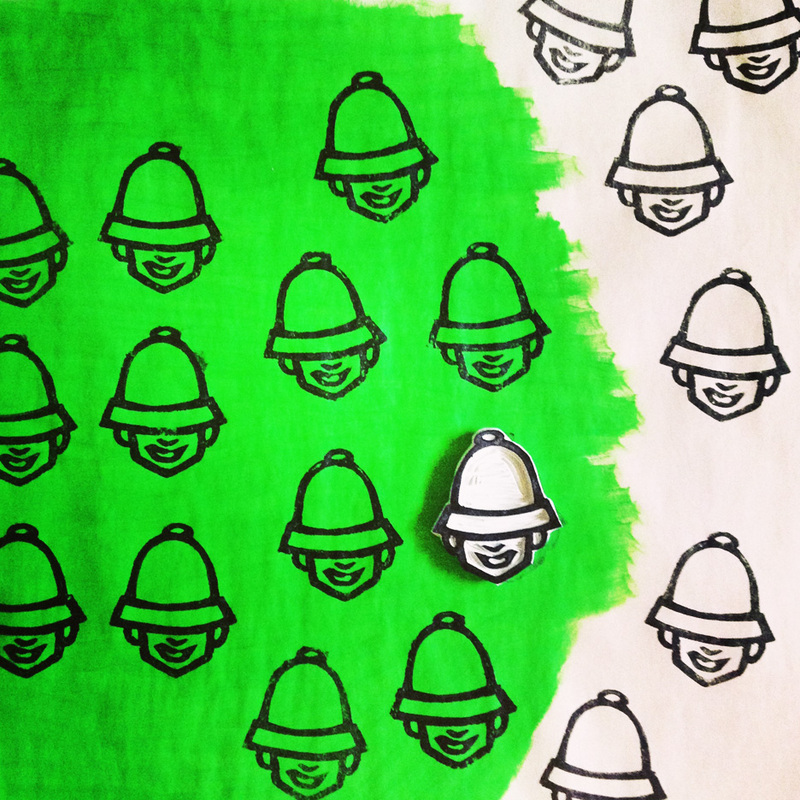 I print them and make stickers, t-shirts, I add them onto objects, and on and on. This was the first test print above, and I loved it. The stamp itself is small, only about 3″x3″ but I would like to make a larger version also in rubber linoleum, and one that supports multiple colors. After seeing this image printed, I was sold. The character will officially become the new NEWYAWK series, the NEWYAWK B-BOY Series. So naturally I wanted to play with some more color after completing the painting and generating the print. 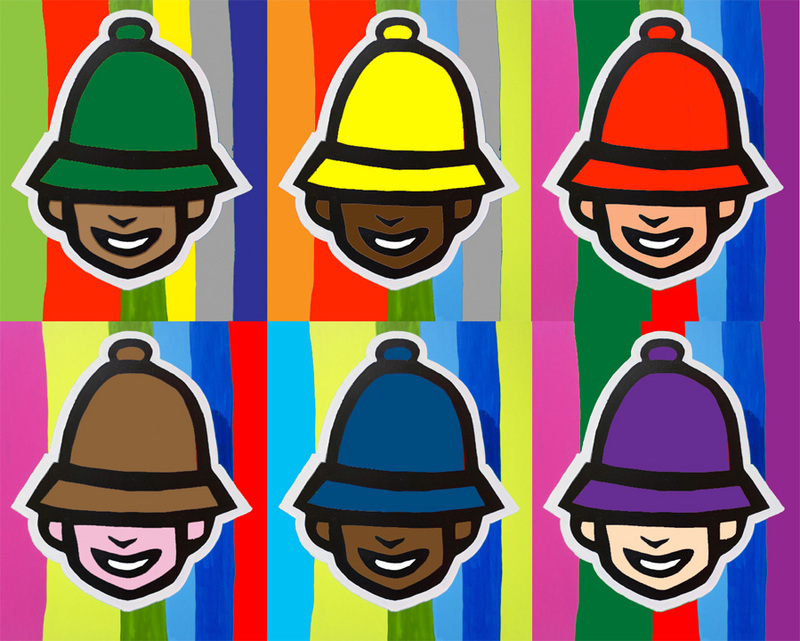 I jumped back into illustrator to play with a series of color schemes. Im looking into this as a new series of screen prints in a limited edition, more on this soon. In the process of this high resolution play I thought it might be cool to make a motion graphic out of the image. GIF making and animations are something I have been exploring over the last year, so this was the next piece created below. 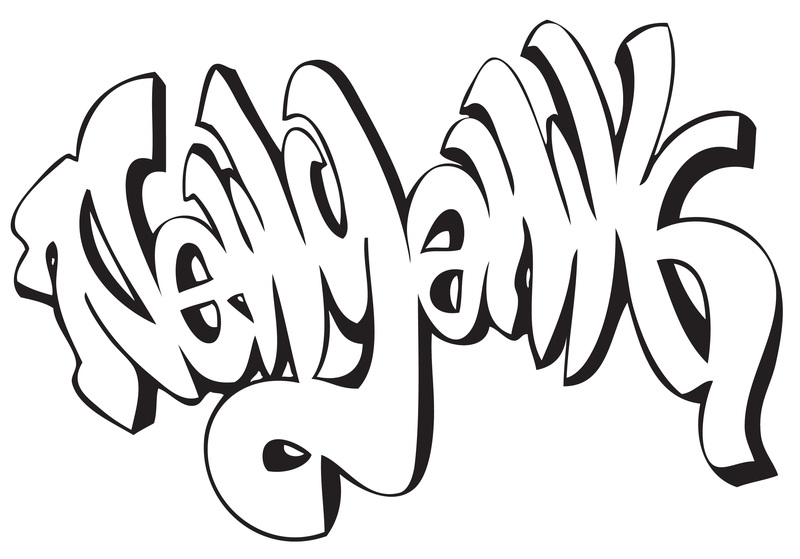 Along with the new graphic, the NEWYAWK tag will accompany the image, much like the NEWYAWK classic t-shirt logo. I have been kicking around a series of new hand-styles, but have not yet decided on what I like most, or what fits best. Maybe multiple versions will be accessible and the customer can select what tag they want with their print. Which style do you like? I like sharing my process and keeping things transparent, as an educator this seems to be quite natural, plus I enjoy helping others. Maybe you are thinking of creating a brand, or a series that may translate well onto garments or in a series of prints. 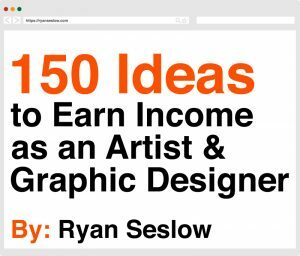 I do spend time looking at the work of other artists and brands, but ultimately I enjoy the process of allowing what happens and build things in a grass-roots kind of way. Share your work with your friends and family, ask them to also share the works, reach out to artists who have work that inspires you, and ask for feedback, but most of all, have fun. NEWYAWK has always been based on fun as its main ingredient. More soon on all of this, please feel free to comment and send some feedback! Thanks for your support! 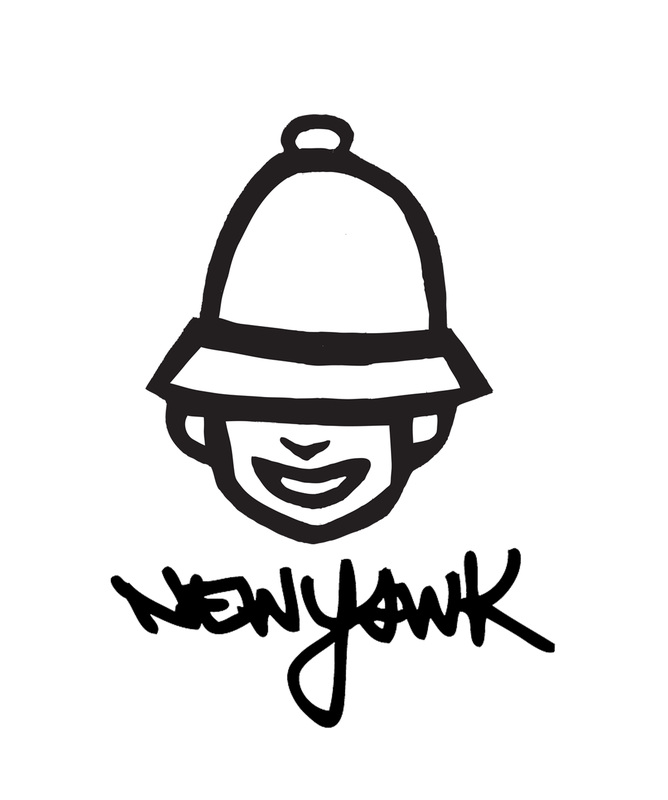 all NEWYAWK images and products are ©ryanseslow/newyawk and may not be used in anyway shape or form.